Posterchild is hard at work in Toronto, not only taking over ads but improving upon the poor quality of the street furniture. I can't say enough good things about Posterchild's street work. "I installed this piece yesterday! I wrote in 2008 about these pillars, and the rest of the Coordinated Street Furniture program in general, and that is a good place to go for background on this project, but I’ll get into more detail here about these “Information” Pillars specifically: 120 are due to be rolled out across Toronto- according to the cities website, 28 have been installed thus far. They are an embarrassment and a shame for Toronto. Toronto is a great city, but we have a bad reputation amongst the rest of our nation. That isn’t anything new. We are thought of as a cold, ugly city obsessed with profit and completely bereft of culture. I live here, I love it here, and I know that image of us just isn’t true- but what other impression will we give to tourists and visitors to our city when we can’t even manage, as a city- the biggest in Canada I’ll remind you, to erect a simple post with tourist information and a map on it without succumbing to the temptation to privatize it and turn it into a profit-making venture? These “Information booths” are strictly billboards first, and tourist information second- and a distant second at that. The pillars are structured and oriented so that the ads get the best visibility and well over double the surface area. In fact, in most cases you would walk right past these ugly streetlevel billboards without ever realizing that it was SUPPOSED to be a tourist information pillar, never suspecting that there was a map tucked into the back, along with map dispensers- and in some cases- interactive touch screens. About those screens- I imagine that no one really ever expected the fancy hi-tech touch screens (How Toronto!) to operate indefinitely, but even I was taken aback when they were installed not working. They didn’t work from DAY ONE. They have NEVER worked. You can go check. Have a look at this booth I improved. The screen is dead. The map dispenser? It’s LED screen scrolls “SOLD OUT” and someone has posted the helpful label “Coming Soon” (Presumably, So you don’t waste your toonie on tourist information that actually won’t ever be coming.) The advertisements, of course, have been operational since the day the pillar has been installed. Like the streetlevel billboards masquerading as phonebooths in New York: As billboards, these pillars always work. At least the scrolling LEDs at the top of the pillar give the time, right? It’s just too bad that the time displayed is incorrect by an hour. your experience of it for pleasure. They tell tourists what to buy, not where to go for free walking tours. Toronto is spending tons of money selling itself as a cultural place. Events, promotions, slogans: we are told that we “Live With Culture”- and yet at the same time the city is defeating it all with short-sighted stupid moves like this. Yes, it’s just street furniture. But street furniture has such a huge impact on how our city looks and feels. It shapes it on the ground, it makes the first impression, and it continuously shapes further impressions as we explore the streets and all the sights and sounds that they have to offer. And if we ever get lost in our explorations, we can always go to the nearest “info to go” pillar and find out what perfume we ought to be wearing. Of course, tourist information pillars should be providing a map and helping the lost AT MINIMUM. They should also provide some information on local lore, landmarks, and legends. So what I’ve done is fix this pillar (something I just couldn’t do with the broken payphones of New York) it is now, at least for the time being, a true tourist information pillar. 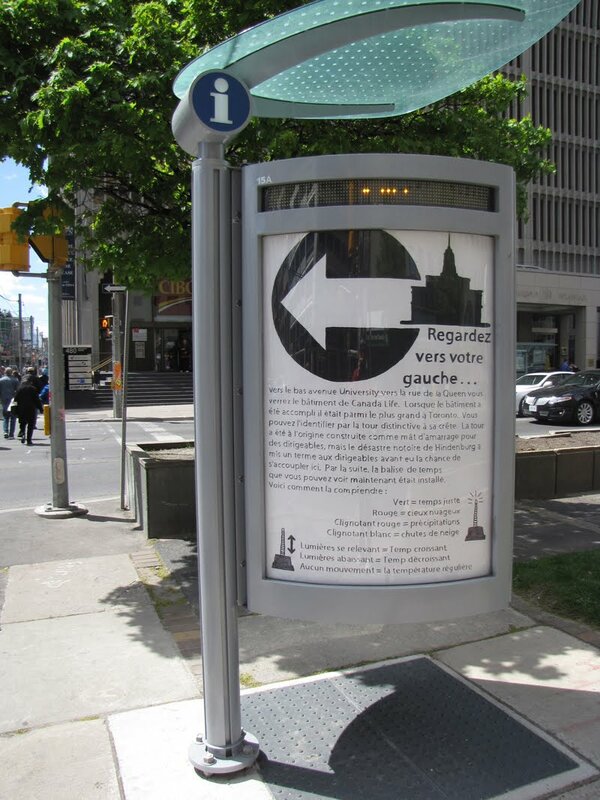 It currently informs passersby that care to look, in the two official languages, about the nearby Canada Life Building and it’s weather beacon in brief. I hope it shows just a little of the great proud history and culture that we have to offer here in Toronto, and also how a different way is not only possible, but easily achieved. 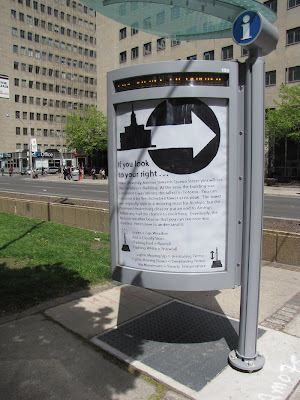 Imagine the rich possibilities if every future “info to go” pillar actually showcased some site-specific local history and knowledge?"